Chuck has written three books. In spite of popular demand, my third book is now out: A Dad’s Work is Never Clear: Tales of Love, Marriage, Parenting and Ice Cream. Lots of Ice Cream. As you can see, I continue to flout publishing industry conventional wisdom and common sense when it comes to book title length. My Amazon / Create Space eStore, where I get the highest percentage of royalties. Nose-Sucker Thingees, Weeds Whacking Back & Cats in the Bathtub: Does Life Get Any Better? 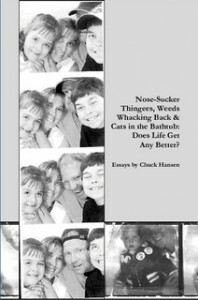 – A treasure trove of Chuck’s humor essays that provide a funny, refreshing, positive and insightful look at life, and holding onto balance and perspective throughout life’s daily trials. On engagement parties: “Often this is the first opportunity for the family and friends of the young lady to meet the result of the biggest decision of her life: whom to marry. Now, let’s be honest. You know you. There’s no way they come away thinking she made a good choice." Purchase Nose-Sucker Thingees, etc. through Amazon.com, BooksaMillion.com, BN.com and local book stores like Book People in Richmond, Virginia. 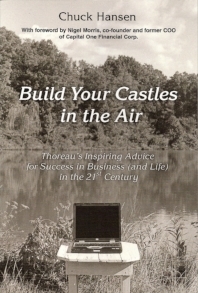 Build Your Castles in the Air: Thoreau’s Inspiring Advice for Success in Business (and Life) in the 21st Century — More than 150 years after Thoreau penned his masterpiece, Walden is stunningly relevant to modern life, especially business life. In Build Your Castles in the Air, Chuck organizes selected quotes from Walden by spheres of business life. The quotes are complemented by quotes from some of history’s greatest thinkers, as well as thoughtful, often humorous reflections from Chuck’s experiences in politics, business, and a nine-month journey through the Caribbean and across the North Atlantic on a sailboat. Purchase Build Your Castles in the Air: Thoreau’s Inspiring Advice for Success in Business (and Life) in the 21st Century through Amazon.com, BooksaMillion.com, BN.com, and local book stores like Book People in Richmond, Va.